Thousands of women and men who could not afford breast health care have received screenings, education and treatments as a result of dollars raised through fundraisers just like you. Join the fight to save lives and end breast cancer forever by committing to a personal fundraising goal today. Here are some tips from past top Race Fundraisers. Set a personal goal today (we suggest $100). Make the first gift yourself to show your commitment! Utilize your Participant Center. Take advantage of online tools including a customizable web page and email templates (login now) to ask friends and family to make a donation to support you. Spread the word on Social Media. Don’t underestimate the power of Facebook and Twitter. Partner with your workplace with Matching Gifts. Does your company have a matching gift program? Send a letter. Reuse your holiday card mailing list. Pledge Form to help keep track of your donations. Individual Fundraising Thermometer to show off your progress (11 x 17). Team Fundraising Thermometer to show off your progress (11 x 17). Download our FREE mobile app to help boost your fundraising efforts. You can log in with your Race username and password, making it possible to send emails, text messages, Tweets and Facebook updates! Click here for more information. 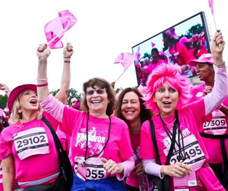 Did you know that you can raise money for this year’s Komen Race for the Cure through Facebook? By adding the Komen Race for the Cure fundraising application to your Facebook page, you can easily extend your fundraising efforts to your network of friends on Facebook. Get started now. Click on the IMPACT FUNDRAISING™ app through Facebook to install. Follow the Facebook steps and start collecting donations from your Facebook friends.